With China Day at Cannes 2017 fast approaching, Simon Shaw explores what the West can learn from China, Chinese brands, and Chinese culture. With Cannes Lions International Festival of Creativity 2017 underway, we are beginning to see something different with the arrival of China to Cannes. While we might not see Chinese brands doing as well as their Western counterparts in the awards just yet, we are beginning to see and feel the presence of Chinese brands at the festival itself. Le Croisette has become dominated over the past couple of years by western tech brands Google, Twitter, Facebook, and Snapchat, but this year they will begin to feel the presence of their Chinese counterparts. China Day will highlight the importance and the positive impact Chinese brands are going to have globally. I think their refreshing view of the world and impressive culture of innovation will surprise many in the audience. 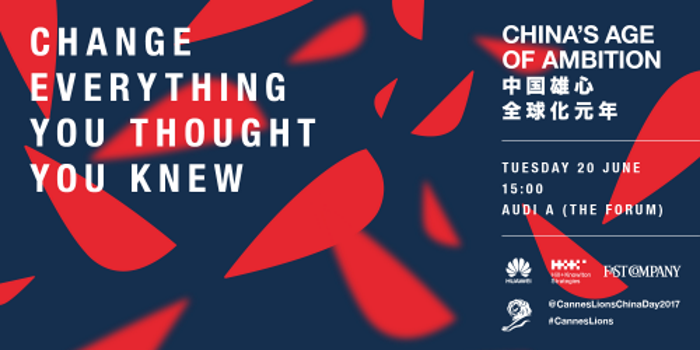 China Day is playing host to a myriad of Chinese brands ¾ Hill+Knowlton Strategies will be joined onstage with Huawei and Fast Company, alongside other sessions during the day such as Tencent and Baidu. We are there to talk about the challenges that Chinese brands face as they move west and how agencies can best partner with them on that journey. We know that younger western consumers are increasingly looking to China for the latest products and best innovation. Shenzhen in the south has become the product innovation center of the world. Brand China, previously associated with poor quality products, has undergone a massive rebrand and has now become synonymous with quality and innovation. Nowhere has this change been more apparent and visible to the West than in technology, specifically smartphones. Huawei has led this charge, in just five years becoming the third biggest smartphone manufacturer in the world. Working with Huawei and other Chinese brands has been an incredible journey for our agency and made us reappraise how we work with clients, evolve new products and services, and challenge ourselves to know more, do better, and rethink what we thought we knew. The phrase, "Change everything you thought you knew," sums up that journey. Our journey with Huawei and other Chinese brands has given us interesting areas and behaviors to explore. While they might be characteristics of some of the Chinese brands we know, the learnings are relevant for consideration by any business or agency in today’s constantly changing and accelerating world. What does it mean to be a fast follower? Our view of what that means has had to change. It is not copying or imitating what others do but intelligently learning what customers want. Being 100% client centric and then delivering the products, services, and experiences they want, only better and quicker. It certainly does not mean copycat. Today’s world is complex. The Vitruvian man who may have known much across many different areas is consigned to the history books. Forming a coalition of knowledge and sharing responsibility for change creates a new kind of alignment and movement within a business. On a map, the world might still be broken up by lines on a page, but the real world is not. We live in a borderless world, where cultures can truly influence and learn from each other. If you were to ask an average Western consumer if they had heard of the Alibaba, WeChat, QQ, Tencent, Haier, or Wanda, they may now know who you were referring to, yet these brands are set to be some of the leading global brands of the future and the brands our children will become familiar with. In this borderless world, how do we ensure we are open enough to accept, adopt, and learn from them? China has 4,000 years of culture to look back and learn from. This is one of the most interesting challenges we face. In the West, we need to rethink what we thought we knew if we are to work together with Chinese brands and explore an exciting, joined-up future for the world.